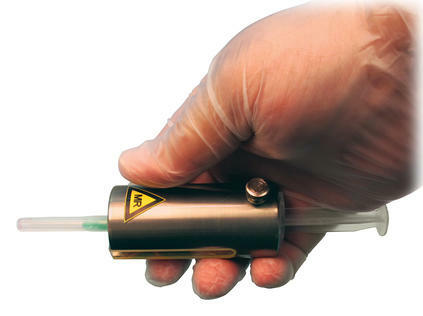 This non-magnetic, Pro-Tec PET/MR Syringe Shield reduces hand exposure from syringes containing 511 keV radionuclides. The barrel of the shield is constructed of .34" thick tungsten which attenuates FDG F-18 by 88%. The shield is clearly labeled and engraved as MR safe to avoid confusion. A 5.6 high density, flush-mounted, lead-glass window provides additional protection and optimal visibility. A white reflective surface on the shield interior improves viewing of the syringe's markings and fluid content. A thumbscrew holds syringes firmly in place. 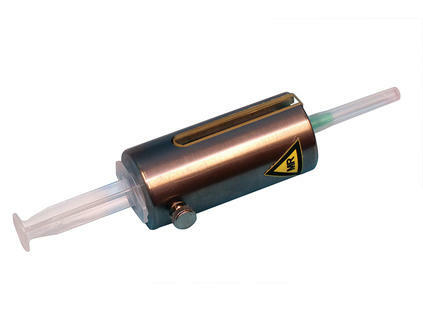 Pro-Tec PET/MR Syringe Shield accommodate the standard sized 3 cc and 5 cc syringes.